"This mouth-watering dip tastes like a hoagie!" Tear the ham, salami and American cheese into small pieces. Place in a large bowl. In a medium bowl, blend the mayonnaise and oregano. Mix the mayonnaise mixture into the ham mixture 1/2 cup at a time, until meats and cheese are well coated. Mix in the onion. Before serving, mix in the lettuce and tomatoes. 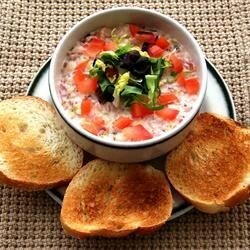 Serve with the hoagie roll pieces for dipping. I made this exactly as the recipe stated and took it to a huge SuperBowl party with lots of college-aged folks and people did not like it. I came home with 95%. Will not be making this again.